Patsy Elaine Nissen, 82, a great woman, mother, grandmother and great grandmother, died peacefully at her home on March 27, 2019, in the company of her loving and caring family. 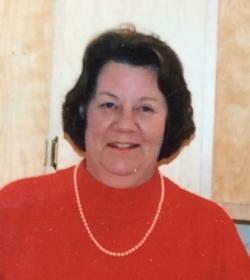 Pat, as she liked to be called, was the beloved wife of the late Stanley Nissen. Much loved mom of Glenn (Pam), Kendall (Lori), and Krista (Doug); cherished grandmother of Liza, Ashley, Ryan, Hannah, Kelsey, Kiersten, Shannon, Halden, and Cullen; dear great grandmother to MaKenah, Hudson, Wyatt, Violet, Colton, Amara, Andi, and Cassin; dear sister to Glenna and the late Max, Winston, Barbara, and Carol. Remembered by many nieces and nephews. Mom dedicated her life to her family. She was a proud and exceptional cook and showed her love by making sure everyone who entered her home had something to eat. The public is invited to visit with Patsy's family at her home, 14 Nissen St., Perth-Andover, NB, on Saturday, March 30, 2018 starting at 2 pm. A celebration of her life will take place a later date. Interment will be in the Presbyterian Rural Cemetery. As an expression of sympathy, memorial donations may be made to your charity or organization of choice. Arrangements have been entrusted to Brunswick Funeral Home, Perth-Andover. Three little words. Forget me not. To show, dear mother, we think of you.